I recently stumbled across a survey conducted by the event registration company EventElephant regarding the importance of Facebook as an influencer of attendees’ decisions whether to attend an event or not. Long story short, the results were commandingly positive. This makes sense as nightclubs and music venues have a constantly rotating calendar and attendees need a centralized location (Facebook) to get the information they need about upcoming events. 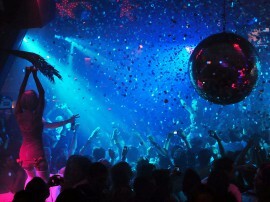 For the nightlife industry, a strong social media marketing strategy thus becomes paramount as a way to fill events. Thankfully, Wavespot can help managers and promoters by making their job easier through giving them more access to potential attendees while at the same time giving attendees the capability to share more about the events they attend. By providing free WiFi through a Wavespot hotspot within a nightlife venue, attendees will connect with the venue using their preferred social network, whether Facebook or Twitter. This will become a very powerful lead as the promoter or manager now knows that this attendee has been to the location and can communicate with them directly, informing them of upcoming events that they believe the attendee might like. Additionally every “Like” gets broadcast over they attendees entire social graph, catapulting the venue’s name and message to thousands of potential future attendees. Sharing pictures & videos of events has almost become a basic requirement for many event attendees. Yet, cellular data networks often don’t work within crowded nightclubs and many times attendees struggle finding good reception. By providing the amenity of a fast, free, secure and dependable WiFi network, attendees can upload all the cool pictures and video they want, while the managers can sit back and watch their social marketing strategy work right in front of their eyes. Wavespot’s powerful CRM suite gives marketing managers and other decision makers the ability to track the growth of their connected profiles. One of the most interesting features of this is the ability to discover your brand’s biggest influencers. These are the people who are talking about you the most, sharing your content with their friends and are just incredibly powerful brand ambassadors. By recognizing and rewarding these loyal attendees, managers and promoters have the potential to turn these fans into fanatics. One of Wavespot’s most powerful features is the ability to automatically update company information on a myriad of review and event sites. This means that new specials or events can automatically be published across these sites with little effort, making sure that your message gets out to the most amount of people, with the most accuracy. Wavespot is a great solution for the Nightlife Industry as promotion of events is becoming ever more dependent on social networking sites such as Facebook and Twitter. Please visit our event organizers page to learn more and find out how you can get your own Wavespot unit and watch your attendees list grow!